MONTREAL - Canadiens GM Bob Gainey announced Monday the signing of defenceman Andrei Markov to a four-year contract (2007-08, 2008-09, 2009-10, 2010-11). As per club policy, financial terms of the agreement were not disclosed. "Andrei Markov is one of our best players, and a huge part of our hockey team. We drafted and developed a player who has become an elite defenseman in the NHL. His desire to remain a member of the Canadiens' organization was evident, and today we are very pleased to have a long-term agreement with Andrei," said Bob Gainey. Markov, 28, will begin his seventh season with the Canadiens in the fall. In 2006-07, he was fourth on the team in scoring, second among the club's defensemen with 49 points in 77 games (6 goals, 43 assists), and 56 penalty minutes. Markov's assist total (43) ranked sixth among NHL defensemen. He completed the season with a plus/minus rating of plus-2, led the team with ice time averaging 24:28 minutes per game and was second among Canadiens' defensemen with 128 shots on goal. Five of his six goals and 32 of his 49 points were recorded on the powerplay (5-27-32). 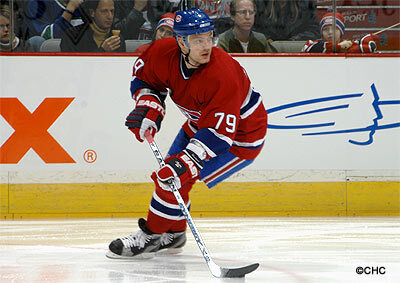 A native of Voskresensk, Russia, Markov has played 411 career games with the Canadiens since his NHL debut back in 2000. Over that period of time he registered 207 points (46 goals, 161 assists) and 226 penalty minutes. Twenty of his 46 NHL goals were scored with the man advantage. On the world stage, Markov represented his native country at four IIHF World Hockey Championships, two World Junior Championships, and was a member of the Russian National Team at the 2006 Winter Olympics in Turin. Earlier this month, Markov was named to the 2007 World Championships All-Star Team following the World Hockey Championships held in Russia.